When you’re driving from Halifax to Cape Breton, you’ll probably be looking for a reason to get out of the car, around the time you arrive at New Glasgow. 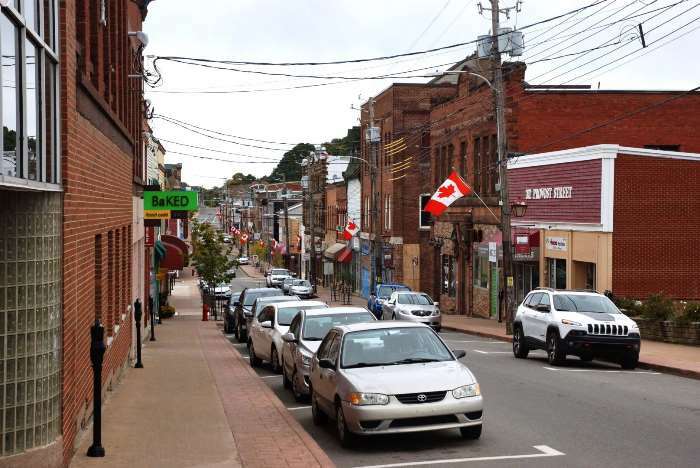 This small town is located along the banks of the East River of Pictou, and it has a nice little downtown — although the town does face some challenges. New Glasgow is located just north of Trans Canada Highway 104. It’s about 160 kilometers from Halifax, and 105 kilometers from Cape Breton Island. 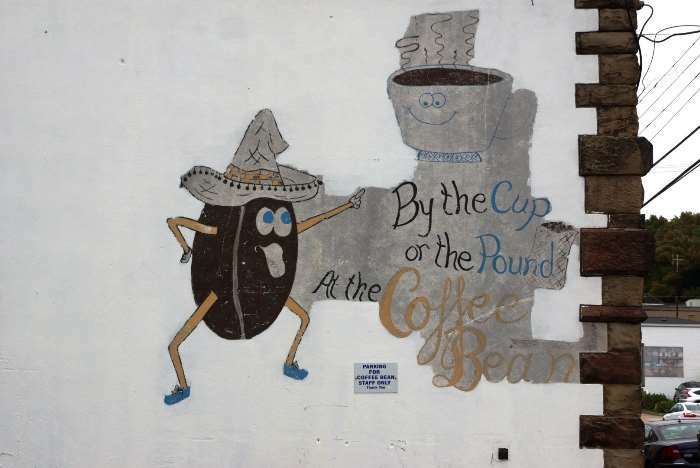 When I began to research New Glasgow, I came across a story on the web titled “Is New Glasgow Really That Bad?” That came as a surprise to me, because I had just visited New Glasgow, and I didn’t think it was that bad (whatever “that” means). But, it turns out, in 2016, New Glasgow was rated the worst place to live in Canada, by Moneysense.ca. 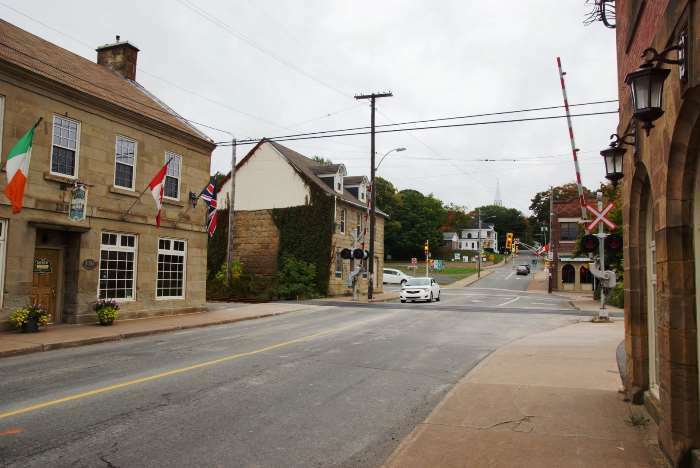 The website ranked 219 Canadian cities, primarily on economic factors, and New Glasgow has been at, or near, the bottom of the list for several years now. 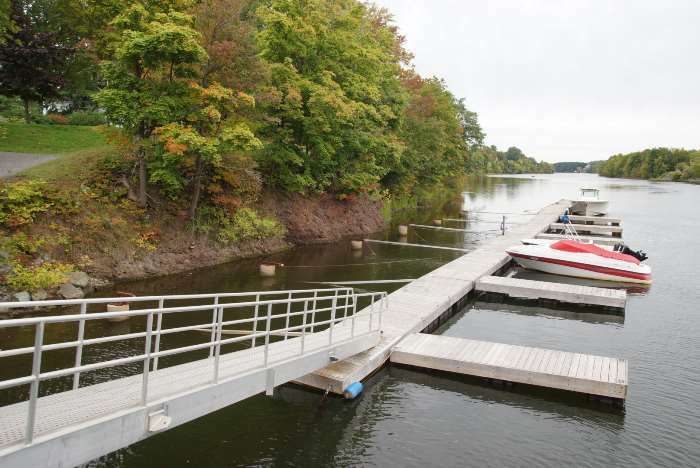 That same story talked to residents who said the beauty of their community can’t be measured in statistics, and people ought to come and see New Glasgow for themselves. Well, that’s exactly what I did. I started exploring at Carmichael Park, on the west side of the river. 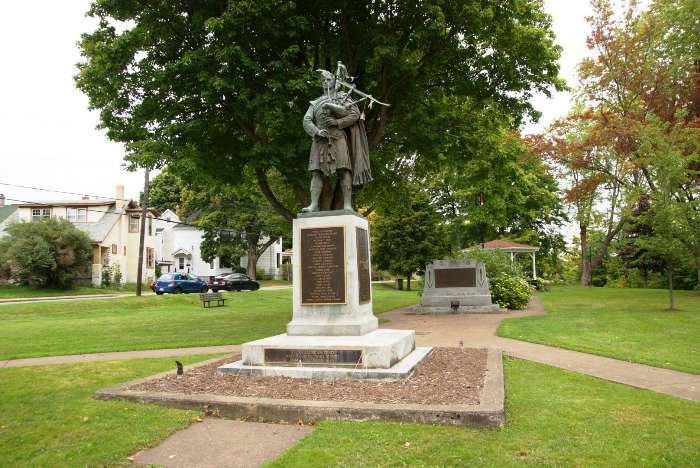 The town’s cenotaph stands in the middle of the park, topped with a bagpipe player and engraved with the names of lives lost in war. 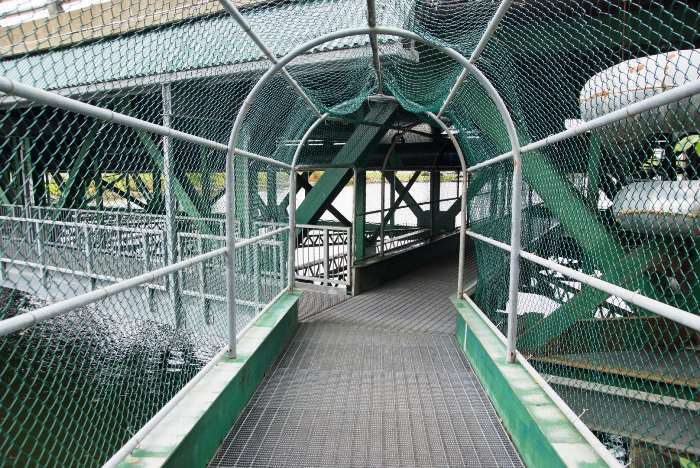 To get from Carmichael Park into downtown, you can either walk on the sidewalk atop the bridge, or use the pedestrian walkway that’s underneath. From either place, you’ll have a nice view of the river. If I had been there a week later, I would have seen a much better display of fall colors. But, as of October 1, the leaves were just beginning to turn. There’s also a walking trail on both sides of the river, if you’d like to extend your walk. … and then the downtown core. On the day of my visit, I saw a lot of cars parked along Provost Street, but very few people actually walking on the street. I was there on a Sunday morning, so it wasn’t the best time to judge the level of activity in the town. 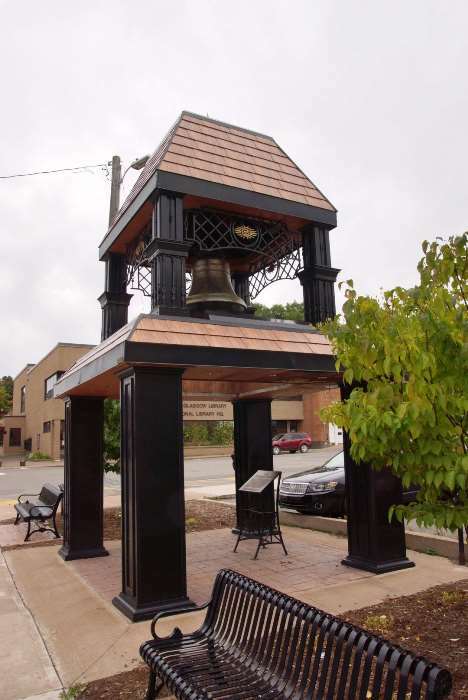 … you can check out the town’s old fire alarm bell, which dates back to 1901. 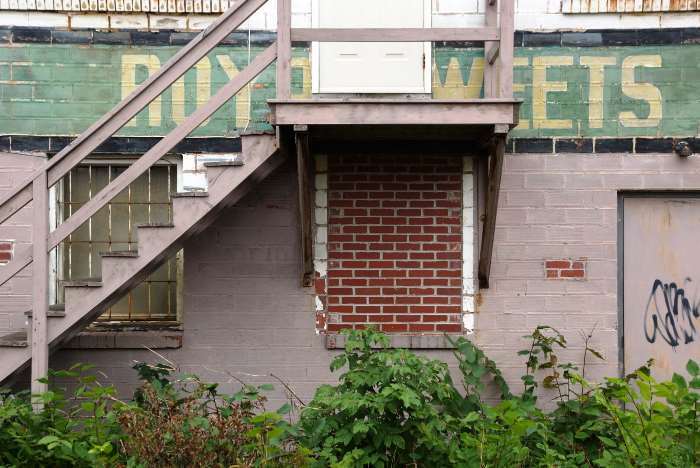 It’s also fun to explore some of New Glasgow’s alleys. I didn’t see anything during my visit that would make me think that this is Canada’s worst town. In fact, everything seemed quite nice — and it looked like the town has put some money into parks and trails, to make the experience nicer. I can’t speak for what it’s like to live there, but there certainly isn’t anything terrible about a short visit. New Glasgow looks like a nice place to stop and explore, while you’re making the drive across Nova Scotia.